The Liberal Democrats are on a mission to go from “protest back to power”, the party’s departing leader, Sir Vince Cable, is to say. In a speech in York, Sir Vince will call for the party to continue arguing for the benefits of staying in the EU. He will also accuse Prime Minister Theresa May of prioritising Conservative Party unity over maintaining peace in Northern Ireland. 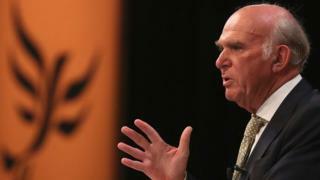 Sir Vince, 75, will step down in May after leading the Lib Dems since 2017. Next week, Mrs May is expected to bring her withdrawal agreement back to the Commons for a third time after it was twice voted down by large margins. Mrs May’s efforts to win over Tory Eurosceptics to back the deal have focused on attempts to revise the backstop, the measures in the Brexit deal aimed at preventing the return of a hard border in Ireland. “The intensity of the campaign to remove it speaks volumes about the underlying motives of those who demanded Brexit and now demand a ‘clear Brexit’,” Sir Vince will say. Sir Vince will also target Northern Ireland Secretary Karen Bradley personally for criticism, following a series of gaffes. Ms Bradley previously said that deaths caused by the security forces in Northern Ireland during the Troubles were “not crimes” – comments she ended up apologising for. She also admitted to initially not understanding that nationalists did not vote for unionist parties during elections. “It really is quite shocking that this government is so lacking in talent that it employs a secretary of state for Northern Ireland who says she doesn’t understand sectarian voting patterns and then compounds this public declaration of ignorance with a blatantly and naively one-sided view of the killings in the Troubles,” Sir Vince will say. Sir Vince, who clashed repeatedly with Mrs May over immigration policy while they sat around the Cabinet table during the coalition years, will use his speech to return to the issue, saying it highlights a divide in British politics. The Lib Dems have 11 MPs – down from the 57 they had in 2010. The party has struggled electorally since 2010, when it formed a coalition government with the Conservatives. Sir Vince, a former business secretary under the Coalition government, will step down after the English local elections in May. Leading candidates to replace him include the current deputy leader, Jo Swinson, relative newcomer Layla Moran and former environment secretary Ed Davey.